Disaster can strike in many ways; financial, health, relationships or a death in the family. Sometimes you know they’re on the horizon, like the recent death of my daughter’s dad from Melanoma (the nastiest form of skin cancer) but sometimes it sneaks up on you and catches you unaware. With or without notice, a disaster can shake you to the bottom of your soul. 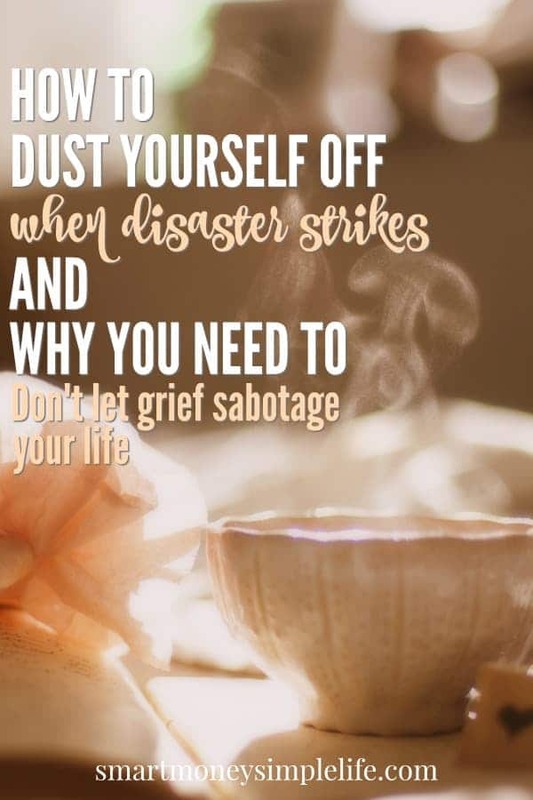 Dusting yourself off after disaster strikes and finding a way to move through the experience can be a very real struggle. Whatever type of disaster you’re dealing with, your emotional response is much the same. You’ve probably heard about the five stages of grief: denial, anger, bargaining, depression and acceptance. We tend to associate grief with the loss of a loved one but grief can be a response to any number of disasters and not just disasters that strike you personally. Just look at the world’s response to the loss of David Bowie or (my favourite actor) Alan Rickman. You can also experience grief when financial disaster strikes or your marriage ends. The first stage is always to acknowledge what and how you’re feeling. You might not be grieving the loss of a life but you could be grieving the loss of a future you saw for yourself. Acknowledge that. Don’t try to hide it or ignore it. You might not spend equal time in all the five stages of grief but you’ll no doubt visit them all at some point in your journey through the experience. Why is it so important to acknowledge the grief? When you don’t, you set the scene for behaviours that mask how you’re feeling. These behaviours can be just as destructive to your ongoing well-being as the original disaster. Comforting eating is a popular one, along with retail therapy. Not to mention even more risky behaviours like taking drugs or abusing alcohol. When my own father died, I struggled to get through the depression stage. I still struggle with that eight years on. I spent so much time being strong for those around me that I never really allowed myself to grieve properly and along with developing insomnia, I also used food to soothe the pain. Both of which had a direct impact on my waistline. Now that we’re faced with grieving my ex-husband, I’m very aware of our we’re dealing with our grief and I’m on the lookout for avoidance behaviours sneaking into our lives. For everyone who ever found themselves in debt, or drowning in clutter, or spending half their earnings on junk food or getting high, there was undoubtedly an event that triggered that behaviour. A grief unprocessed. A hurt blamed away. Even the most resilient of us need time to grieve. So, if you’re shopping to numb the pain, don’t try to explain it away, explore it instead. When did it start? Was there an event that occurred around the same time that could have caused a grief response? Why does [fill in your own avoidance behaviour] make you feel better? How can you fill that need in a positive way? Grieving the loss of a man I knew for most of my life and the father of my only child is going to be a challenge. Has grief impacted you? How did you manage it? What did you learn? Please share your story with us in the comments. I’m sort of going through this right now. We’ve been trying to sell a house that’s been nothing but a money pit for two years. We finally found a buyer, sunk $6500 into the house to pay for repairs, and then three days before closing found out we still need to pay $26,000 to fix something else or the deal is off. We’re already at the end of our financial rope. No options are good, and me and my husband are seeing the life we planned for ourselves slipping away, because we’ll be saddled with as much debt as we can possibly afford for years and years to come. We’re doing the only thing we can – try to figure out how to fix the situation – but there are no good options. And of course, I have no idea what to do about the mental toll this is all taking. Lindsay, that’s just awful. Surely if they’d signed a contract, they couldn’t specify an additional condition after the fact? Can you negotiate to drop the price instead of making the repairs? Other than talking to the real estate agent and your bank to find out if you have any other options open to you, my advice is to step back for a moment or two and (hard as it might be) take a deep breath and then focus on what’s going RIGHT in your world. I’ve been in a similar situation and I can still remember feeling like I was suffocating. It’s not something I’d like to experience again. In the end, I found a less obvious way out of my predicament. I have my fingers crossed you will, too. It has just been 5 months since my Dad passed away at the age of 86. His death was not unexpected, but that didn’t make it any easier for my brothers and I. I feel like I have turned a corner though. After months of not sleeping much, I have slept most nights in the past couple of weeks. I did the typical things…I am now 12 pounds heavier and a couple of thousand dollars more in debt. I have finally started cooking real meals again…12 pounds of junk food was enough I guess! I have stopped shopping too. Grief is a process and I’m still a work in progress but I think I can see bits of my regular life coming back.